The 3 Station Portable Restrooms Trailer Comfort Series offers a durable and easy to maintain environment with an attractive interior design. The floor plan includes 2 women’s suites and 1 men’s suite, each with a separate entrance. Each women’s suite includes 1 water-saving china pedal flush toilet, wall-to-wall lockable vanity with large shatterproof mirror, metered faucets, and in-counter wastebasket with soap and paper-towel dispenser and toilet-paper holder. The men’s suite also includes a water saving urinal. 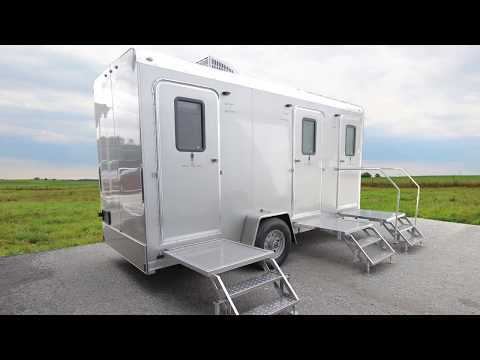 The 3 Station Portable Restrooms Trailer also includes a smooth, durable white fiberglass interior, insulated walls and ceiling, and one piece aluminum seamless roof with smooth siding. Easy access for guests of all ages with 2 easy steps with full landing and double handrails. Abundant porch lighting at each entry door and 1-piece non-skid rubber flooring ensures your guests can enter/ exit safely and securely no matter what time of day or night. Your guests are also sure to enjoy the comfort of a fully climate-controlled environment maintained with air conditioning and heat strips! Download a 1 page PDF product description for the 3 Station Portable Restroom Trailer | Comfort Series from Portable Restroom Trailers, LLC.